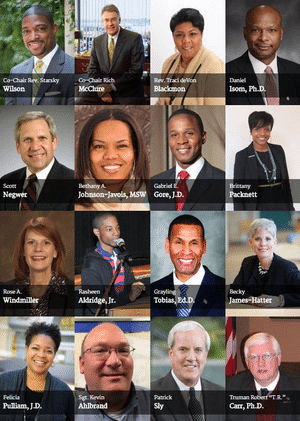 Ferguson Commission Members Announced: Will They Tackle Race? Three hundred people applied to be on the “Ferguson Commission” created by Missouri Governor Jay Nixon to do something—what, exactly, isn’t clear—about the social and economic conditions that have been linked to the killing of unarmed teenager Michael Brown and the subsequent protests against Ferguson’s nearly all-white government and police departments, the militarized police response to the protests, and perhaps the cluelessness of some of the region’s political leaders about the racial tensions occurring under their noses. Rev. Starsky Wilson (@ReverendStarsky), co-chair of the commission, president and CEO of the Deaconess Foundation: “The work of this commission aligns with the work of Deaconess Foundation, which I lead, to advance the health of the region and its people through effective alignment of philanthropic, social service and governmental resources and policies.” Rev. Wilson, as readers may remember, was one of a group of national foundation leaders who issued a statement recently to government officials on how to respond to protests in the wake of a grand jury decision. It may be due to the excerpts chosen for publication by the Post-Dispatch, but the printed statements of the members other than Aldridge, the obviously youngest member of the commission, don’t specifically address race as one of the underlying issues to be understood and confronted. The statements from Windmiller and Johnson-Javois suggest that the inequities that some people in metropolitan St. Louis experience aren’t simply happenstance, but systemic, and both overt and covert in their causes. Their comments also suggest an awareness of the structural racism issues that were reflected in the Ferguson dynamics.